He had said he wanted strawberries on it…and cream. Oh, and licorice. 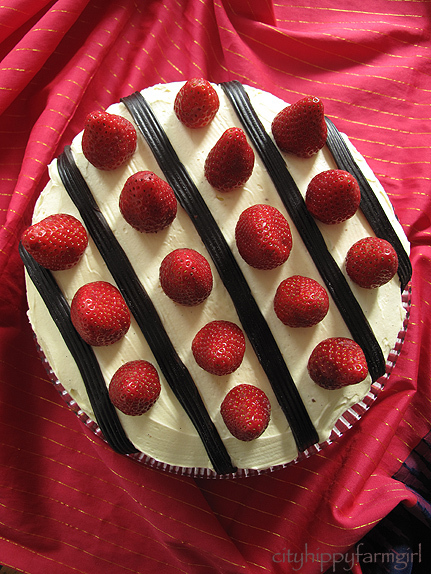 Strawberries, cream and licorice cake please! It was Little Monkey’s birthday and the food requests had come in. The other food to be eaten were minor details, the cake was where it was at. Happy to oblige, I had an image in my head, and just hoped that I could cut the picture out of my mind and transpose it to a cake plate. Basic cake recipe I used the same as the Pink Cupcakes, but doubled the recipe and baked it in a large spring form pan. The yogurt in it, really does give the cake a lasting quality, that seems to only taste better in the next few days, not going stale at all. Cake was then sliced in half when cold, spreading bottom layer with some Summer Loving Jam, and half half mixture of home made vanilla bean mascarpone, and whipped cream. Top layer on, and a thin crumb layer of the mascarpone mixture goes over all the cake, then smoothing over the final layer. Place strips of licorice and line up strawberries. Next, candles lit and birthday presents safely clutched in small fingers. Line up birthday diners, for an enthusiastic chorus of Happy Birthday. This entry was posted in Food Glorious Food and tagged birthday cake, easy, food, kids cake, making your own mascarpone, mascarpone, recipes, strawberries and cream by cityhippyfarmgirl. Bookmark the permalink. Happy Birthday to Little Monkey. Licorice on a cake is quite an advanced taste! Goes made for the stuff, does the little fella. Wow, that just looks amazing. Probably one of the best looking cakes I’ve ever seen. I don’t like licorice, but I’m sure the rest of this cakes tastes every bit as good as it looks! Thanks Frugalfeeding. It was fun to make, and not too ‘fluffy’. Monkey Boy has already put in his birthday cake order for next year. He wants exactly the same….but mama, maybe not so much licorice. Thank you Jane, he think he had a really good birthday. It was fun to make. I like the planning, and then creating…crossing my fingers it all comes together. I would love a birthday cake just like that! Brydie- you are a very sweet momma! Happy Birthday indeed! What a delicious cake! He has great taste – licorice and strawberries what a yum combo. Spectacular looking cake! 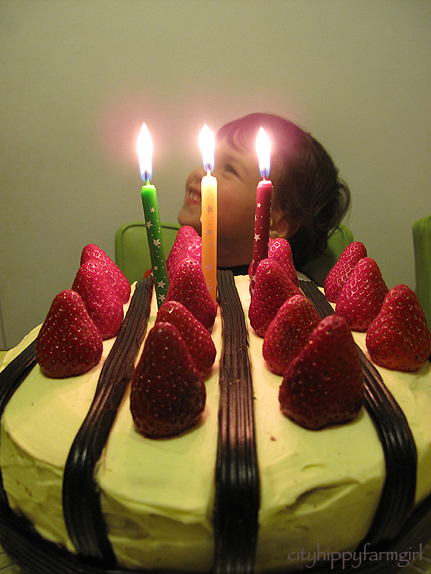 just gorgeous – that last picture says it all – clever mum and happy birthday boy – I think licorice looks great on cakes but always seems an odd taste to pair with cake – or is that just me! Beautiful! You have some art skills there, I would have never thought of putting those items together that way! Happy happy day Monkey. Look at that smile 🙂 And no wonder – what a beautiful cake. I’m so impressed, as I don’t think I would have had thought of such a gorgeous lay out of those three ingredients together. I’d probably have put liquorice pieces around the outside or something equally sub-optimal! Happy Birthday to you, Happy BIrthday dear Little Monkey, Happy Birthday to you (done in my best singing voice). What an beautiful cake – you are very lucky to have such a clever mommy. And wasn’t it all worth it for that smile. What an amazingly fabulous cake – you just get better and better. Happy Birthday to Little Monkey (a rather belated one now). Happy birthday to the Little Monkey! That cake looks amazing. That cake looks truly amazing and though I’m not a fan of licorice I completely appreciate the aesthetic of it all. That boy had highly evolved taste, does he. And his mother has highly evolved creativity. WOW. Found your blog on SherryGreens site. Seems I have stumbled upon something of greatness. 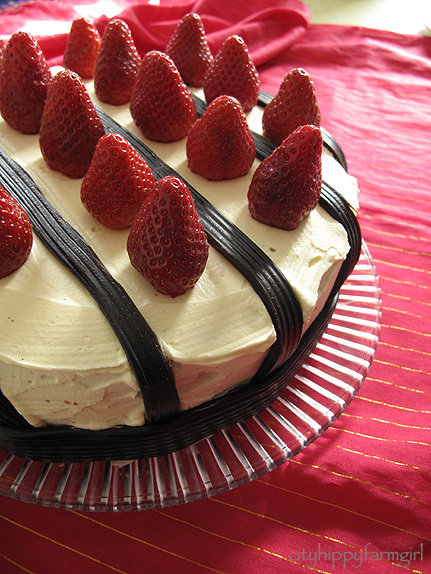 Anyone who can make a licorice cake is someone I must add to my stalking list.